KATHMANDU, Nepal -- The Lumbini International Research Institute (LIRI) and the museum building in Lumbini weredesigned by Kenzo Tange as components of the Lumbini Cultural Centre. They were designed based on the use of cylindrical vaulted structures. The spaces were created by stacking, intersecting and cutting out sections of basic units of cylindrical vaults. But why did Kenzo Tange use the cylindrical vault? 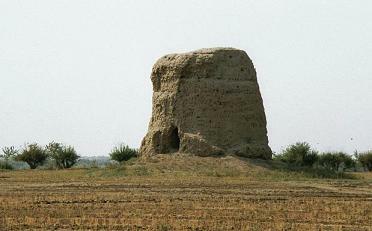 Dr Christoph Cueppers of LIRI mentioned that he had seen some photographs of early Buddhist structures in Central Asia which had used cylindrical vaults. He asked me to look out for any such evidence or examples when travelling around Central Asia. The border between Uzbekistan and Afghan-istan stretches for about 134 kilometres along the course of the Amu Darya. Here lies Termez, a city with a history that stretches back to the time when in 329 BC Alexander the Great crossed the river which was then called the Oxus. This was the eastern reaches of the Persian Empire, the province of Bactria-Sogdiana where Bessus, the murderer of the Persian King Darius III had run off with the crown. Even though Alexander soon caught and executed Bessus, he was pulled into a three long years of conflict with the Sogdians. This required the construction of numerous fortifications. One of these was Kampyr-Tepe, a port and customs city on the main route and crossing point of the Oxus. The archaeological site of Kampyr-Tepe is a maze of excavated walls, sections cut through the hillside showing numerous layers of habitation over an area of approximately 12 hectares. A thin black streak indicates a fire that must have destroyed the city in ancient times. Huge pots that have been unearthed point towards the vast storage of a port town. The shards showed numerous forms, shades and textures of pottery that were found scattered over the entire site. Today the river has moved away, over four kilometres to the south. There seems to have been a lot of excavation work done with far too little conservation of that which has been exposed. A part of the fortification wall was reconstructed, but it looked forlorn and rather out of place. The Greco-Bactrian culture flourished and spread out across Central Asia. It crossed the Oxus and the mountains towards Taxila, where it came in touch with the Mauryan Empire. In the third century BC under Emperor Ashoka, the Mauryans had adopted the teachings of Gautama Buddha. Buddhist missionaries were sent into the Greco-Bactrian regions and over the next few centuries, the unique Greco-Buddhist culture was created. The wrangling of the Greeks to maintain their kingdoms in Bactria and northern India came to an end with the rise of the Kushan Empire in the first century AD. Over the following three centuries under Kushan rule, Buddhism spread and flourished in Central Asia. The fortified settlement of Kampyr-Tepe was further expanded to cover approximately 30 hectares and outer fortification walls were constructed. Around this urban centre, various Buddhist complexes were established. We were not able to visit the archaeological remains of Kara-Tepe, since it was located within the border security zone of the military. It was however possible to visit Fayaz-Tepe, a Buddhist monastic complex and stupa. Sanjar Allayarov of the UNESCO Tashkent office had worked on conservation of this site and showed me around with great enthusiasm. Fayaz-Tepe consisted of a rectangular complex of about 117 by 34 metres with three sections. The central section comprised of a large courtyard surrounded by rooms where various Buddha statues had been found. The northern section was living quarters of monks and the southern section included the dining hall and kitchen. There was clear evidence of many parts of the monastic complex having wooden post and being covered by a wooden roof structure. However the rooms and passages that were three, four and 4.5 metres wide showed evidence of having been covered with cylindrical vaulted roofs made of mud bricks. Structures such as these must have been the inspiration for Kenzo Tange in Lumbini.